Prophetess Omideyi was ordained as a Prophetess at Christ Apostolic Church (Bethel) UK in 1993. Although she qualified as an Associate of the Institute of Chartered Secretaries and Administrators, she has dedicated her service to the work of God since 1985. The Prophetess was involved in full-time ministry with her late husband, Apostle Ayotunde Omideyi, the Pioneer and first General Overseer of Christ Apostolic Church (Bethel) UK (incorporating Sower International Evangelical Ministry). Prophetess Omideyi founded ‘Harvesters’, a ‘body’ within the church, set up to enable the Christian women of the church, to demonstrate the love of Christ through charitable deeds. 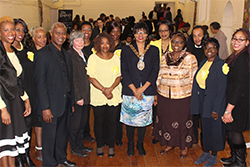 The Prophetess was also responsible for establishing and managing – for over ten years, the Harvesters Prison Project, which catered for the welfare of African, Caribbean and Black British women in Her Majesty’s Prisons. As is the case when involved with the welfare of those who are vulnerable, this often spiraled into uncharted areas through which God unfailingly led the Project. Thanks be to God! Since the passing of her husband in September 2011, Prophetess Omideyi has taken on the mantle of Minister in Charge at the Church. In order to sustain and maintain the work that Apostle Omideyi invested in the Lord’s vineyard, the Prophetess by the grace of God, continues to teach the Word of God and, to build upon the legacy of the message of Salvation that Apostle Omideyi left to the UK, Tanzanian and Nigerian branches of the ministry. In memory of the late Apostle, the Prophetess currently edits and publishes his sermons as books for the propagation of the gospel. Prophetess Omideyi’s door at the vicarage is always open, whether for nurturing or nourishment. The Prophetess staunchly believes that God can transform anyone – even the ‘vilest offender’ – and her heart is always open towards giving anyone an opportunity to turn around so that they can be won for Christ. The Prophetess strives to be a seasoned teacher of the Word of God, a revivalist and a tireless intercessor – dedicated to serving God and man. Well known for her tenacity, the Prophetess’s continues to pray that people will/should make it to heaven. Prophetess Omideyi’s constant prayer is that, through the grace of God, the mantle of the Holy Spirit rests and remains upon her. May the Lord honour Prophetess Omideyi’s prayer as she continues to walk in the Holy Spirit.